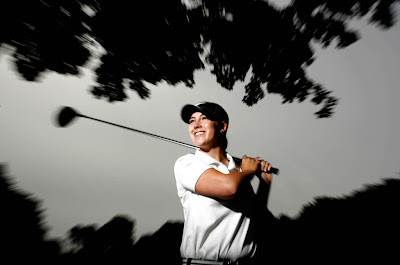 Today’s Canada Games Athlete portrait is of golfer Jennifer Armstrong. This was actually the first shoot done for this series. 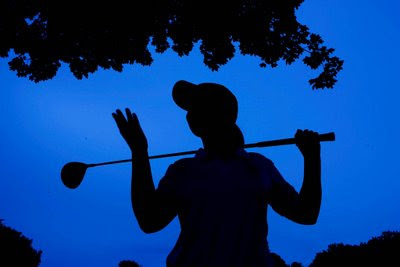 I shot her at the Riverside Golf and Country Club where she is a member. So the first day of shooting, the weather was overcast and spitting rain a tiny bit. Not what I was hoping for, but that’s the light I had. To be able to control the light on Jennifer, I metered from the bright sky. That made her go dark, allowing me to add the light I wanted with the flash. But how did I get the blue sky instead of the gray overcast? This is done using a neat technique combining white balance and filters for the flash. I set the WHITE BALANCE (WB) on the camera to TUNGSTEN/INCANDESCENT (the little glowing round bulb). This adds extra blue to the image to correct for the yellow light given off by that type of light. However, because this is daylight, everything just turns blue. So, when I turn on the flash to fill in the light, since the flash is DAYLIGHT balanced, it goes completely blue as well. So, to warm the light of the flash up, I placed a CTO gel over the flash head. This filter is orange and converts DAYLIGHT to TUNGSTEN. Where can you get this filter? 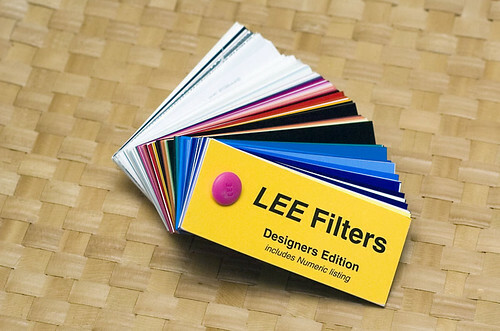 Well, you can get it for free from Lee Filters! They make colored filters for stage lighting, and put out a sample pack containing hundreds of filters so you can see all the various colors and effects. These samples also just happen to completely cover the flash head! If you contact Lee filters, (Canada here, US here) they will send you a pack for free! Or if you are in SJ, send me an email and I can hook you up. I have a box of em from the company. As I was shooting, I saw how the leaves of the tree made for an interesting framing element, so I began to incorporate them into the composition. I then wanted to try incorporating the sun into the frame. The sun was a bit higher in the sky, so I had Jennifer stand on the 18th green and I was down at a lower angle so I could get the sky at the top of the frame. Since the ambient light was lower, it gave me the opportunity to try out some slower shutter speeds(1/30th-1/15th of a second at 100 ISO) and do some rotating, panning and zooming the camera during the exposure to get interesting blur. Since Jennifer was completely back lit by the sky, she is completely sharp as the only light on her is from the flash. Then I tried some on the normal white balance without the gel, and I really liked how they turned out. Next up on Monday should be softball. Not sure though because I didn’t get my paper!! !